The Little League World Series champs from Honolulu landed Monday at Daniel K. Inouye International Airport to a hero’s welcome and were praised by Gov. David Ige and Mayor Kirk Caldwell for representing their state with humility and sportsmanship during their undefeated run in South Williamsport, Pennsylvania. Star-Advertiser. 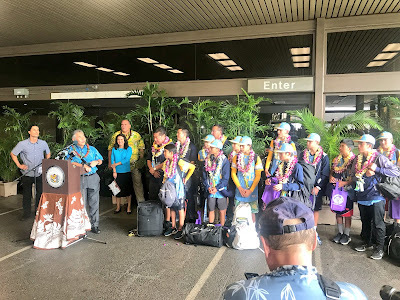 Crowds, cheers welcome Hawaii's Little League World Series champions at airport. KHON2. Lawsuit Aims To Stop Proposed Ballot Measure On Education Funding. Honolulu’s city attorney says the ballot title misleads voters on a proposed constitutional amendment. Civil Beat. Why Progressives In Blue Hawaii Face An Uphill Battle. Five of 14 candidates backed by progressive political organizations survived the Aug. 6 primary. Civil Beat. Hawaii schools launch mass texting program for parents. About 200 schools across the Aloha State use SchoolMessenger to communicate important information such as school closures and safety alerts. Hawaii News Now. The most serious hurricane threat to Hawaii in 26 years brought something else with it — unprecedented cooperation between government agencies and the private industries that help keep the islands running, those involved in the response say. Civil Beat. Stores discourage hurricane returns. Some retailers took pre-emptive measures to avoid a flood of returns following the rush to buy water and other hurricane-related supplies as Hurricane Lane approached the islands. Star-Advertiser. Hawaii's Endangered Snails Were Rescued Amid The Threat of Lane. Hawaii Public Radio. Heavy rain on Oahu triggers flash flood warning, road closures. Deep tropical moisture associated with Tropical Depression Lane is triggering heavy rain and flooding across Oahu on Tuesday. Hawaii News Now. The Honolulu Board of Water Supply on Monday unanimously gave a final OK to a five-year rate hike schedule that increases water bills for most of its residential users while keeping rates about the same for those who use the bare minimum. Star-Advertiser. Hawaii Gov. David Ige is expected to announce a decision this week on where to locate a replacement for the Oahu Community Correctional Center, after signing off on the $525 million project’s final environmental impact statement. Pacific Business News. Halawa Correctional Facility Warden and Oahu Community Correctional Center Chief of Security named. The Department of Public Safety (PSD) announced the promotion of Scott Harrington as warden for the Halawa Correctional Facility and Thomas Evans as the Oahu Community Correctional Center chief of security, effective September 4. KHON2. Construction of the Joint Management Center in Honolulu is back on. The project abruptly stopped on July 9th after the City issued a Notice of Termination for Watts Construction for failing to fix numerous issues outlined in a warning letter written in February. KITV. Hurricane Lane dumped record amounts of rainfall on the Big Island and parts of Maui but spared most of Oahu. But, public utility and city leaders aren’t waiting for another close call. Hawaii Public Radio. Residents’ response to Lane was boom or bust for many businesses. Hawaii didn’t take a direct physical hit from Hurricane Lane, which was downgraded to a tropical storm Friday, but it did dampen performance for some businesses. Star-Advertiser. Glitzy New Driving Range Proposal At Ala Wai Worries The Regulars. Lounges and microchip balls: The city hopes a public-private partnership will re-energize its golf course. Civil Beat. The trustee of Abigail Kawananakoa’s $215 million estate has asked a judge to appoint a guardian ad litem for the aging heiress because he believes she is not able to make sound decisions about her ongoing court battle. Civil Beat. Fighting To Save The Crumbling Koko Crater Trail. A group of devoted hikers is hauling bricks up the steep trail to rebuild crumbling steps. Now they want the city to help. Civil Beat. They hoped it would be their field of dreams. Instead, it's a dust bowl. Ewa Mahiko District Park's football field is mostly dirt and uneven footing. Hawaii News Now. Loyal patrons returned to Wailana Coffee House on Sunday to savor their foreshortened time with the modest, Polynesian-themed restaurant, which will soon become a wistful memory. Star-Advertiser. Mayor Harry Kim told department heads and emergency workers Monday he intends preliminary assessment of the damage done by former Hurricane Lane to be completed expeditiously. Tribune-Herald. Maunakea Visitor Information Station to be closed Sundays. The Maunakea Visitor Information Station was closed Sunday and will be closed on Sundays for the foreseeable future as skyrocketing visitor rates overwhelm the facility. Tribune-Herald. The U.S. Geological Survey detected a glow coming from deep within the fissure 8 cone Saturday morning, but the glow was no longer observed during Monday morning’s overflight. Star-Advertiser. No Incandescent Lava Seen In Fissure 8, But Lots Of Steam. Big Island Video News. National Park Service law enforcement cited 11 people Saturday after they were found illegally entering Hawaii Volcanoes National Park. Tribune-Herald. Woman charged with felony after trying to remove child from school. West Hawaii Today. Some Waikoloa Village residents will be forced to evacuate their homes over a period of multiple days in September as the U.S. Army Corps of Engineers hunts for unexploded ordnance in neighborhoods around the village. West Hawaii Today. Keala Kawaauhau, a member of the seminal Hawaiian rap group Sudden Rush, Hawaiian activist and longtime Hilo morning radio personality died in his sleep Monday. He was 47. Tribune-Herald. Thyne chosen new Maui fire chief. David Thyne, a veteran of more than 30 years with the Maui Fire Department, was selected Monday to be the new fire chief. Maui News. Maui News, DOH clash over release of reports. Judge to decide whether to make public crash case psychiatric assessment findings. The Maui News is supporting and the state health director is opposing the unsealing of court psychiatric reports that led to the acquittal by reason of insanity of a woman who had been charged with murder in a fatal traffic crash. Maui News. Maui developer Waikapu Development Venture is asking the Maui County Council to fasttrack an 80-unit workforce housing project in Wailuku. Pacific Business News. Some Upcountry Maui residents remain stranded by giant sinkhole. What used to be the center of Puu Way is now 20 feet below ground level. KHON2. Heavy flooding is being reported around Maui including parts of Makawao and Wailuku this afternoon. Maui Now. Ports open but items missing from store shelves. Barge on the way, but no Costco chicken. Maui News. Kauaula Valley fire victims have one goal: rebuild. Residents grateful for the generosity shown from across the island. Maui News. Conditions “Unprecedented” in Battling West Maui Fires During Hurricane Warning. Maui Now. Mauna Kea hearing on Maui planned for Sept. 28. Maui News. Kauai highway, school closed as heavy rains drench the island. The National Weather Services said a rain gauge in Hanalei showed rain rates over 4 inches an hour as moisture from Tropical Storm Lane continues to soak parts of the state. Hawaii News Now. North Shore faces more flooding. It felt like Hurricane Lane skipped Kauai at first. As it turned out, we aren’t out of the woods yet. Garden Island. Many hoping for strong turnout in general election. The percentage of registered voters on Kauai may have increased in this year’s primary election, but compared with the 2014 election, the number of those who cast ballots decreased. Garden Island.